Originally considered a single species, genetic research has established the clouded leopard is actually two species defined in part by geographical boundaries. Neofelis nebulosa, the species we have at our parks, is restricted to mainland Southeast Asia, and Neofelis diardi is found on the islands of Sumatra and Borneo. The clouded leopard is forest-dependent, and its habitat is undergoing the world's fastest regional deforestation rates. There are also high levels of illegal trade in its skin and bones. Given these significant threats to its existence it is likely the wild population size may be fewer than 10,000 mature individuals, with no single population numbering more than 1,000. They are the smallest of the big cats and, whilst they are known as clouded leopards, cloudies are not directly related to normal leopards at all. The beautiful markings on their coat, which give cloudies their name, provide camouflage in the dappled light of their forest habitat. They are also one of the best climbers in the cat family, with short sturdy limbs giving strength and a low centre of gravity, a very long tail to aid balance, and large paws with sharp claws and specialized padding that moulds to the shape of the branch. They can even rotate their hind feet backwards due to flexible ankle joints, enabling them to descend trees head first. From the little that is known about cloudies in the wild it seems likely that monkeys are their favourite prey, although they will also take birds, fish, and small mammals such as squirrel. They have the longest fangs, or canine teeth, relative to their body size than any other cat, and with an enormous gape of around 100 degrees they have sometimes been compared to primitive saber-toothed cats. Outside of the wild, clouded leopards present a reproductive challenge, not least because there is a high incidence of aggression between males and females, which can result in the death of the female. This has made clouded leopards one of the most difficult cats to breed in captivity. Cloudies are extremely nervous and sensitive, also secretive and nocturnal - all factors that make it hard to study their behaviour and manage them in captivity. However, we have over four decades of experience with these elusive animals at our parks in Kent and one of the best, most successful, breeding programmes in the world. For a number of years Howletts has held the European studbook for the species, which means the animals are genetically managed as a single meta-population to maximise the overall opportunities for all animals held in European zoos to operate as a viable and functioning breeding population. 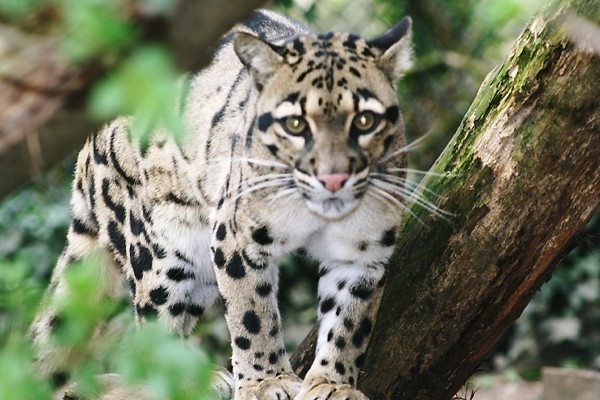 On the 4th August this year The Aspinall Foundation was delighted to host the first ever International Clouded Leopard Day at Howletts. Each year this will be a day of international awareness for this beautiful and elusive cat in the hope it will increase the profile of clouded leopards both in captivity and in the wild.